This issue brief will illustrate the reality of this crisis by first looking at what the data have to say about how much money Americans are putting away for retirement. It will then evaluate the results of studies that use complex modeling to estimate what percentage of the population is at risk of falling short of achieving a financially stable retirement. What is made clear is that no matter how households’ needs in retirement are projected or how their incomes, assets, and debts are measured, an unacceptably large share of Americans appears at risk of being forced into a lower standard of living in retirement. The most convincing estimates of the share of households who will have insufficient assets stand at slightly more than 50 percent. But even more sobering is the fact that the most optimistic studies still find that nearly one-quarter of retirees are falling short. The data available on how American households build up financial assets and how they have done so over time show an American public that is struggling to prepare itself for retirement and that is becoming less well prepared over time. Three clear trends in particular illustrate to what extent Americans are underprepared for retirement. According to a recently released household survey conducted by the Board of Governors of the Federal Reserve System, as of 2013, approximately 31 percent of Americans reported having zero retirement savings and lacking a defined-benefit, or DB, pension. This finding is in keeping with the results of other comprehensive Federal Reserve surveys and means that nearly one-third of people in the United States currently have no money put away in any type of retirement account to supplement their Social Security benefits. Among respondents ages 55 to 64—those nearest to retirement who already should have built up significant savings—the share who reported having no savings or pension was still 19 percent, or approximately one out of every five near-retirement households. That such a large share of Americans lacks any savings should not be particularly surprising given that so many still lack access to the primary savings vehicles used by workers today: workplace retirement plans. As of 2014, only 65 percent of private-sector workers had access to a retirement plan through their jobs, and only 48 percent participated in one. Even when looking just at full-time workers, more than one-quarter still lacked access to an employer-sponsored retirement plan, and more than 40 percent did not participate in one. Moreover, these numbers have not been getting significantly better over time. In fact, studies that use data that allow for long-term analysis indicate that the share of private-sector workers with access to workplace plans is actually lower now than it was in the late 1980s. As traditional DB pensions become increasingly rare, it is more important for workers to build up savings in defined-contribution, or DC, plans such as 401(k)s or in nonemployer-based individual retirement accounts, or IRAs. Unfortunately, most households have failed to build up anywhere near enough in these accounts. As of 2013, the median retirement account balance among all households ages 55 to 64 was only $14,500. 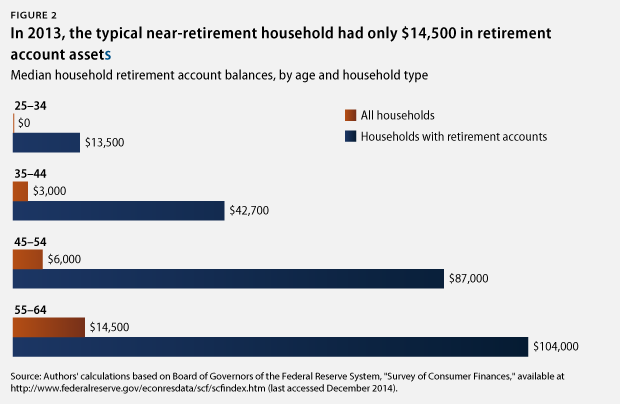 Even after excluding all households that had saved nothing, the median account balance of near-retirement households was still only $104,000. If a household uses all of this money to purchase an annuity from a life insurance company that will pay a guaranteed monthly income for the rest of the household’s life, this income will provide only approximately $5,000 per year in retirement—nowhere near what the household is likely to need. These facts may seem somewhat confusing to those who know that the aggregate sum of savings in such plans has grown significantly over time and is indeed quite large, at more than $12.1 trillion in 2013. While this is an impressive sum, the distribution of these assets across households results in typical middle-class households having very low savings in their accounts. Simply put, the wealthy hold most of these assets, while the middle class and the poor have comparatively little. As of 2013, the top 20 percent of working-age households by income owned 67.7 percent of all retirement account assets, while the bottom 50 percent owned only 7.4 percent. Among older households, a study for the Social Security Administration found that only 19 percent of families headed by a person over age 65 were actually receiving distributions from a retirement account as of 2009, with only 8 percent of families in the bottom income quartile receiving any such distributions. One simple way to measure how capable households will be of maintaining their standard of living in retirement is to look at the ratio of their total wealth to their income. This gives an idea of how much in total assets a family has built up relative to approximately how much they consume in a given year. As data from the Survey of Consumer Finances, or SCF, make clear, while these ratios did improve for older households during the 1990s and early 2000s—when the housing bubble was growing and stock markets were booming—they subsequently collapsed following the Great Recession and have shown no signs of recovering. All told, households near retirement age were worse off in 2013 than they were in 1989. Meanwhile, ratios for younger households showed almost no significant growth even when the economy was doing well during the late 1990s and early 2000s, and they have since fallen off significantly in recent years as well. 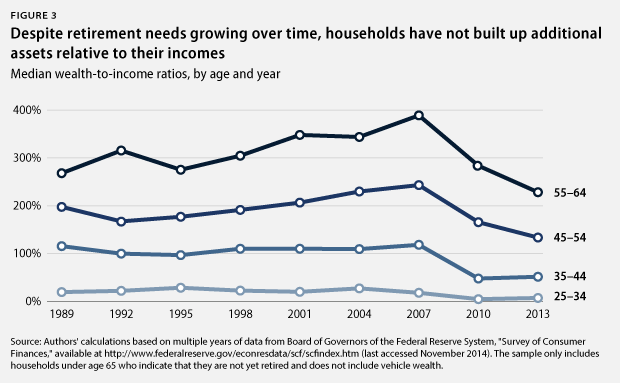 This means that today, households across all age groups have wealth-to-income ratios that are effectively unchanged from or significantly below the ratios achieved by households in previous decades. This is particularly worrisome given that during this time period, workers increasingly shifted away from DB pension plans—the assets of which are not measured by the SCF—to DC plans, the assets of which are measured. Even if households in more recent years built up the same amount of assets as households in previous years, the shift from DB to DC pension plans should have resulted in wealth-to-income ratios rising as the amount of unreported assets decreased. This stagnation of wealth-to-income ratios might be fine if retirement needs had stayed the same over time, but as Alicia H. Munnell of the Center for Retirement Research at Boston College, or CRR, has previously explained in great detail, retirement needs have actually grown significantly in recent decades. 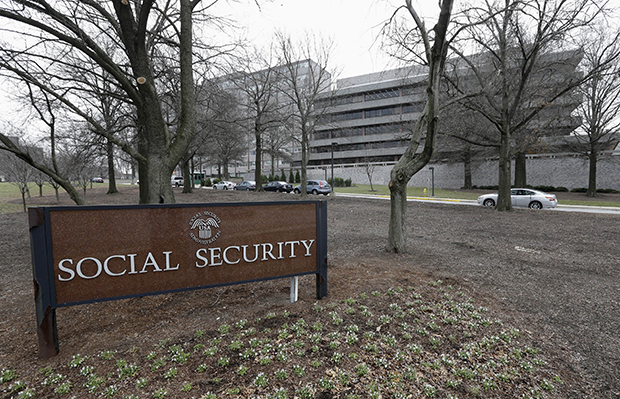 Life expectancy has increased and the retirement age for full Social Security benefits has risen to age 67, meaning workers now have more years of expenses to cover but must wait longer to begin receiving full Social Security benefits. Health care costs also have risen substantially, resulting in higher expenditures for retirees, and the decline in real interest rates since 1983 means that a given amount of wealth accumulated today now produces less retirement income than it would have in previous decades. For all of these reasons, workers should be approaching retirement with greater wealth relative to their income than did previous generations. The data, however, show the opposite is occurring, indicating that current workers are not as prepared for retirement and that increasing shares of younger generations may be forced to muddle through their retirements by continuing to work beyond when they intended, by relying on family and government programs for aid, or by significantly cutting back on their consumption. How do all of these facts fit together? All of these facts indicate that millions of American families are facing the very real prospect of not being able to maintain their standard of living in retirement and that the problem is growing worse over time. However, researchers and policymakers often want to provide a single number that quantifies exactly what share of Americans are at risk of having insufficient savings. Arriving at such a number requires the use of complex modeling, but it can be done. A number of such analyses have been conducted in recent years, producing different estimates. The differences are primarily due to the differing assumptions built into each model and the ways in which some key variables are measured. (see the Appendix for additional details) This section looks at some of the most widely cited studies, including some of the most pessimistic and most optimistic, and describes what they show about the depth of the retirement crisis. What is clear from all of these analyses, however, is that no matter what assumptions or measures are used, an unacceptably large percent of Americans are at risk of having to decrease their standard of living in retirement, and the problem is only getting worse over time. One of the most frequently cited examples of the more pessimistic estimates of Americans’ retirement preparedness comes from the National Institute on Retirement Security, or NIRS, in its report “The Retirement Savings Crisis: Is It Worse Than We Think?” This report uses industry recommended savings guidelines from the brokerage firm Fidelity Investments to assess what share of households are on track to hit an income replacement rate target—that is, the share of a household’s preretirement income that it needs to replace in retirement to maintain its standard of living—of 85 percent. When assessing households’ readiness using the broadest measure of household resources—net worth—the report found that 65 percent of households between ages 25 and 64 were at risk of not meeting their retirement savings target as of 2010. Notably, the share deemed to be at risk increases as households become younger, growing from 67.8 percent of those ages 55 to 64, to 69.8 percent of those ages 45 to 54, to 70.1 percent of those ages 35 to 44. It then falls significantly to 51.1 percent of households ages 25 to 34, but as the report itself notes, the estimate for this age group should be approached with extreme caution, as assessing the preparedness of workers this far from retirement is extremely difficult, and the low estimate is largely the product of the disproportionately low savings target set for this group by the Fidelity Investments savings benchmarks that NIRS uses. Some factors likely result in this study’s findings being potentially somewhat pessimistic. First, the income replacement rate target used—85 percent—is at the high end of standard replacement rate recommendations. Second, the use of a single target rate for all households does not take into account that households with different characteristics may require different replacement rates. Finally, the use of a single schedule of savings targets at each age to measure whether households are on track does not account for the fact that households could potentially use different saving pathways and still end up with the same amount of money in retirement. It is important to note, however, that a number of these methodological choices, such as using a single target income replacement rate, are not unique to the NIRS analysis and, indeed, are used in numerous other assessments of retirement preparedness as well. Additionally, in follow-up publications, NIRS has shown that even when using more conservative savings targets, the share of households it finds to be at risk remains very high. Furthermore, it has illustrated that while savings pathways that backload savings into a worker’s later years may also be capable of achieving similar wealth targets at retirement, they can often be extremely difficult to realistically pursue. Overall, the estimate that 65 percent of American households are at risk is potentially pessimistic and represents a higher-end estimate of the share of the American population that may fall short in retirement. That being said, the NIRS analysis is useful for illustrating in transparent and easy-to-understand terms how American households stack up against the very standards—those put forward by industry professionals—they will likely be using to assess their own retirement preparedness. Additionally, its findings underscore the fact that retirement preparedness is generally getting worse among younger households. At the other end of the spectrum is a group of studies that uses more complex modeling and that is more frequently cited by those who take a more optimistic view of the retirement crisis’ severity. These studies’ results generally paint a somewhat less negative picture than do the results of similar studies conducted by organizations such as the Center for Retirement Research, discussed below, due to their adoption of alternative assumptions about household consumption patterns and their preference for alternative measures of preretirement income. Most important, however, is that despite their adoption of these alternative assumptions and measures—the validities of which are still very much in contention—these best-case-scenario analyses still indicate that an unacceptably large share of American households may be forced to lower their standard of living in retirement and that the problem is growing over time. Among the primary studies often cited by those seeking to paint a more optimistic picture of Americans’ retirement preparedness is a 2012 study by Barbara A. Butrica, Karen E. Smith, and Howard M. Iams that uses a microsimulation model—the Modeling Income in the Near Term, or MINT, model, which is maintained by the Social Security Administration—to calculate to what extent individual households will be able to replace their preretirement incomes in retirement. While not calculating what share of each generation is at risk per se, the study provides a distribution of projected replacement rates for five generations of workers. The numbers often cited from this study are the seemingly impressive median replacement rates calculated for each generation, which range from 84 percent to 98 percent when using the preferable wage-adjusted measure of lifetime earnings (see text box on the next page) and from 109 percent to 119 percent when using price-adjusted earnings that are less appropriate for determining whether a worker will be able to maintain his or her standard of living in retirement. Why use wage indexing over price indexing? When calculating what percentage of an individual’s preretirement income will be replaced in retirement, a key part of the calculation is the measure of preretirement income used. Many studies use an average of a worker’s lifetime earnings, but the question then becomes whether previous years’ incomes should be adjusted using a price index or a wage index. An easy way to think of the differences between using either option is to imagine if a worker’s retirement income target were hypothetically determined using only an average of their first and last years of earnings. For the purposes of this example, let’s say a worker’s first year of earnings was 1973; her last year was 2013; and that in both years she earned exactly the median income, meaning that she was firmly in the middle class. Putting this worker’s 1973 income into 2013 dollars using a price index would only tell us how much money she would need today to purchase the same bundle of goods she could afford in 1973. While that bundle of goods was associated with a middle-class standard of living that year, the U.S. economy has grown significantly since then, above and beyond price inflation. This is due to increases in productivity, meaning that today’s middle-class standard of living is much improved from what was considered middle class just four decades ago. Consequently, if this worker’s price-adjusted 1973 income were simply averaged with her 2013 income and used to set her retirement income target, this would effectively be saying that she should significantly slash her current levels of consumption and adopt a lower standard of living that is somewhere between what was considered middle class four decades ago and what is considered middle class today. Using a wage index to adjust her 1973 earnings, however, would tell us how much money she would need today to afford the same relative level of consumption she enjoyed 40 years ago. In other words, since she was earning a middle-class income by 1973 standards, it would tell us what income she would need today to continue being middle class. If this figure and her 2013 income were used to set her retirement income target, it would result in the use of a target that truly attempted to maintain the standard of living she actually experienced over her lifetime—that of a middle-class American—as opposed to a standard of living based on how much she consumed in absolute terms decades earlier. Of course, the models actually used to determine replacement rates for current workers do not use only two years’ incomes, but the same logic applies when adjusting all of a worker’s past earnings. While price indexing certainly has a role in certain academic research, for the reasons outlined above, we believe that using wage indexing provides estimates of retirement needs that are far more reflective of workers’ standards of living in the long run. More important, however, is what the Butrica, Smith, and Iams study shows about the share of workers likely to fall short in retirement. When using wage-indexed lifetime earnings, the share of workers projected to have income replacement rates below 75 percent—a reasonable approximation of the minimum recommendations of most academics and industry professionals—ranges from 34 percent of the War Baby cohort, or those born between 1936 and 1945, to a full 43 percent of Gen Xers, or those born between 1966 and 1975. 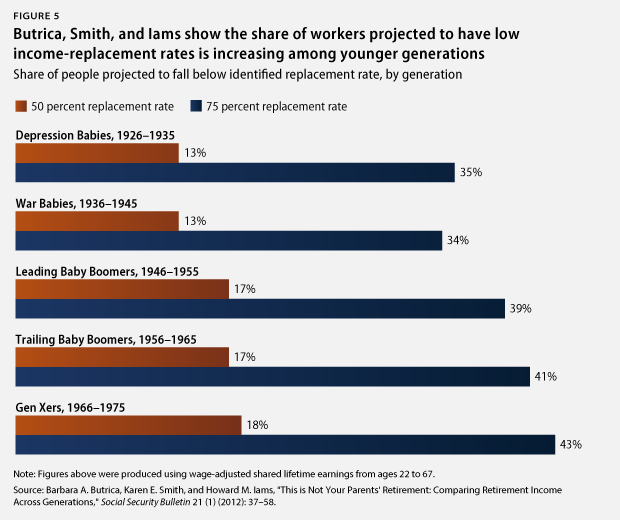 The share of workers projected to have replacement rates below 50 percent ranges from 13 percent of older workers all the way up to 18 percent of the youngest workers. In other words, the study shows that depending on the generation examined, between three and four out of every 10 workers will potentially have to lower their standard of living in retirement, and nearly one out of every five of the youngest workers may have to cut their consumption severely. A second study often cited by more optimistic assessments of the retirement crisis is one by William G. Gale, John Karl Scholz, and Ananth Seshadri. This study differs from more pessimistic analyses in its use of alternative assumptions about how children leaving the home affects household consumption and to what extent retirees will continue to reduce their consumption in their later years beyond the amount by which they reduce it when they first enter retirement. (see text box on the next page) It also uses data on current retirees instead of data on current workers to gauge the share of Americans falling short in retirement. 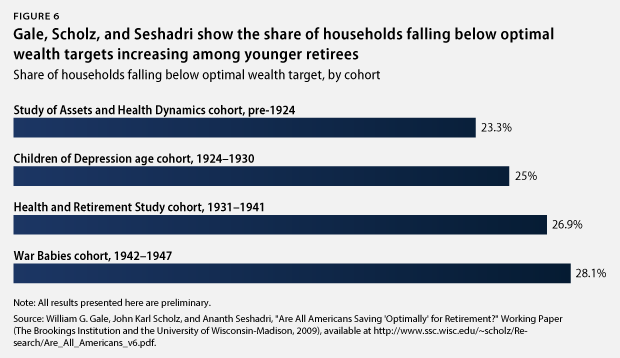 While the original paper published by Scholz, Seshadri, and Surachai Khitatrakun in 2006 used 1992 data to estimate the share of the so-called Health and Retirement Study, or HRS, cohort—those born between 1931 and 1941—falling below their optimal wealth targets, a 2009 working paper update written with Gale provides preliminary estimates for three additional cohorts using 2004 data. The most notable figure from this update is that 25.9 percent of the total sample was found to have insufficient assets, with the median shortfall faced standing at $32,260 in 2004 dollars. While this estimate does at first appear to be significantly lower than those produced by other sources, it still speaks to the existence of a significant retirement savings shortfall that will affect millions of American families. If the study by Gale, Scholz, and Seshadri represents a best-case scenario, than that best-case scenario is that more than one out of every four retired people examined had insufficient retirement income to maintain their standard of living. Significantly, this estimate was produced using data from before the onset of the Great Recession, which wreaked havoc on Americans’ savings and net worth. Furthermore, although this study does not look at current workers, the results show that the share of Americans at risk is growing with each successive generation of past retirees. Again, this indicates that the problem is becoming worse over time. Saying that this does not constitute a retirement crisis would be similar to saying the country would not be facing a housing crisis if one out of every four American families were found to be in danger of losing their home and that share was only projected to grow over time. At the heart of the differences between the models used by researchers such as Gale, Scholz, and Seshadri and those used by organizations such as the CRR are differing assumptions concerning how household consumption changes over time. First, whether or not households are assumed to decrease their consumption after children move out of the home can significantly affect estimates of the share of households at risk. This is because if households do decrease their consumption, they can save more and will have a lower level of average consumption to replace in retirement, both of which will result in their appearing better prepared for retirement. If parents simply shift the expenditures they were making on their children to other forms of consumption—for example, while raising children they made financial sacrifices that only temporarily reduced their standard of living—they will continue saving at their previous rates and will need additional assets in retirement to maintain their current level of consumption. Studies such the one by Gale, Scholz, and Seshadri adopt the former assumption, while analyses by organizations such as the CRR adopt the latter. Second, while almost all analyses assume that households will initially lower their level of consumption when they first enter retirement (see Appendix), whether or not households accept gradual decreases in their level of consumption as they move through retirement beyond this initial drop-off also significantly impacts the share of households appearing at risk. This is simply because if retirees are consuming less in total, they will need to have accumulated fewer assets to fund this consumption. Studies such as the one by Gale, Scholz, and Seshadri do assume that retirees will reduce their consumption willingly over time beyond the initial decrease they experience when they first retire, while models such as the one used by the CRR generally assume retirees will maintain a constant level of consumption throughout retirement following the initial decrease. Which of these assumptions researchers feel are more plausible will determine in part whether they gravitate toward more optimistic studies, more pessimistic studies, or those that fall in the middle. That said, as this issue brief illustrates, no matter which of these assessments is preferred, an unacceptably high share of the American public appears at risk of having to lower their standard of living in retirement, and the scope of the problem only appears to be getting larger over time. But of greatest concern is that the youngest generation looked at by Gale, Scholz, and Seshadri are War Babies—defined in the study as those born between 1942 and 1947—who, according to multiple other analyses, are likely the generation best prepared for retirement. If 28.1 percent of this generation, who were able to build up their savings during one of the best stock markets in U.S. history and who enjoyed significantly greater access to defined-benefit pensions, are estimated to have insufficient resources, it bodes very poorly for younger generations who other studies frequently find to be significantly less prepared for retirement. In other words, it appears quite possible that even given the more optimistic assumptions used by the study, the share of people currently in the labor force at risk of not being able to maintain their standard of living in retirement may be well above 25.9 percent, and the savings shortfalls they face may well be significantly larger. Falling in between these more optimistic and pessimistic studies is the National Retirement Risk Index, or NRRI, produced by the CRR. The NRRI measures the share of households younger than 65 years of age who are unlikely to be able to maintain their standard of living in retirement based on expected income from Social Security; DB pensions; and individual savings, including money in 401(k) plans, individual retirement accounts, and home equity. It takes into account individual households’ unique needs by adjusting target income replacement rates based on past income, and it calculates achieved replacement rates relative to a preferable wage-indexed average of lifetime earnings rather than a price-indexed average. The NRRI shows the share of households at risk as of 2013—the last year for which an estimate is available—at 52 percent, which is up significantly from the 31 percent of households that were estimated to be at risk in 1983. Just as important is that—as is the case in the other studies examined—younger workers are again projected to be significantly less well prepared for retirement. The share of households ages 30 to 39 deemed to be at risk is 59 percent, compared with 52 percent of those households ages 40 to 49 and 45 percent of households ages 50 to 59. Importantly, a number of assumptions built into the NRRI prevent it from being overly pessimistic and may actually lead it to underestimate the share of households at risk. First, it is assumed that all households will liquidate all of their assets in retirement, including their homes via reverse mortgages, and that all households will use their savings to purchase annuities that will provide them with steady checks through the end of their lives. The vast majority of households, however, do neither of these things. The NRRI also only labels households as “at risk” if they are projected to fall at least 10 percent below their income replacement rate target, and it assumes all households will work until age 65, despite the fact that many workers retire earlier and consequently receive reduced annual Social Security benefits. All of these assumptions tend to make the NRRI’s findings more optimistic. Finally, the NRRI also does not account for long-term care costs or explicitly account for health care costs as costs that are separate from and on top of retired households’ other core expenditures. It assumes that if households need to pay for health care in retirement, they can simply decrease their consumption of other goods and services by an amount equivalent to their health care expenditures, and it assumes households do not purchase long-term care insurance. The CRR found that when it did explicitly account for these costs, the share of households it deemed to be at risk increased substantially. Indeed, the NRRI estimate for 2006—the last year for which this comparison was done—rose from 44 percent at risk all the way to 64 percent at risk. No matter how one approaches assessing the retirement preparedness of the American public, the facts of the matter remain the same: A large percentage of Americans are not building up sufficient assets needed to maintain their standard of living in retirement, and the problem is only getting worse for younger generations. While studies that utilize different methodologies may arrive at different estimates of the exact percentage of Americans at risk of struggling financially in retirement, even the most optimistic, which use prerecession data, still find that approximately one-quarter of retired Americans are falling short and that preparedness is growing worse over time. The most middle-of-the-road estimates available place the share of current American workers at risk at more than 50 percent. Only by making such significant changes to America’s existing retirement system can we ensure that all retirees are able to avoid economic dependency and truly enjoy the retirement they have been looking forward to and deserve. Any attempt to project the share of American households that will be at risk of not having sufficient resources in retirement requires making a number of methodological choices and adopting numerous assumptions. While which data sources are utilized will have an impact on studies’ findings, it is often differences related to these methodologies and assumptions that are responsible for the most significant disparities between alternative analyses’ findings. This appendix provides a brief overview of the most important differences that have not already been described above and illustrates exactly how the choices made can determine the extent to which a study’s estimates are optimistic or pessimistic. A household’s income replacement rate target is the percentage of preretirement income it requires in retirement in order to maintain its preretirement standard of living. Whether a household is on track to hit this target is a frequently used measure for determining whether that household is at risk or not. Studies that assume households will need to replace a higher share of their income in retirement will—holding all else equal—generally find that a higher share of households are at risk, while studies assuming lower required income replacement rates will generally find a lower share of households to be at risk. The income range needed in retirement that most academic and industry recommendations fall into is between 60 percent and 90 percent of preretirement income. Importantly, however, these recommended rates vary in a number of key ways. Academic studies that utilize more complex models are now more frequently attempting to account for the fact that required replacement rates may be different for households with different characteristics. Characteristics that are sometimes taken into account include household preretirement income levels, individuals’ marital status, and how many earners live in a household. Industry recommendations are far less likely to take these kinds of differences into account when setting target replacement rates, as their goal is generally to provide more simplistic rules of thumb for all households to utilize while saving. The studies described above that explicitly use target replacement rates to gauge household preparedness are the estimates produced by the Center for Retirement Research and the National Institute on Retirement Security. NIRS utilizes industry recommendations that incorporate a single 85 percent replacement rate target for all households. The CRR utilizes replacement rate targets that vary depending on individual household characteristics but that average to 73 percent for working-age households. The study by Gale, Scholz, and Seshadri, on the other hand, does not use income replacement rate targets to gauge retirement preparedness but instead uses specific wealth targets calculated for individual households using a life cycle model and data on their earnings histories. Essential for calculating replacement rates is the measure of preretirement income selected. Studies of retirement preparedness vary in how far back they look when calculating preretirement income and in which types of income they include in their totals. 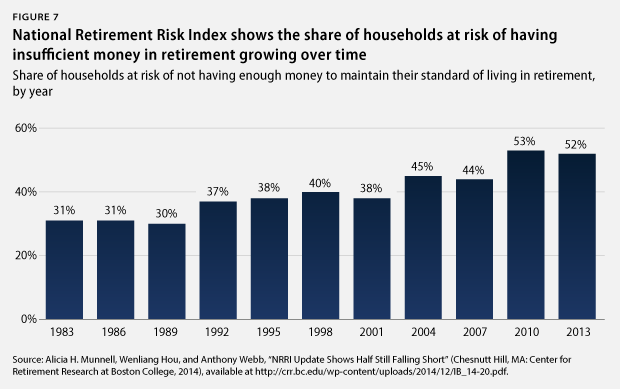 Analyses that utilize higher measures of preretirement income generally find a larger share of households to be at risk, since replacing an identical percentage of a higher income total will require the accumulation of more assets. First, studies differ in terms of whether they consider preretirement income to refer to income earned only in the year or years directly preceding retirement or to an average of workers’ incomes over a longer period of time. The justification for using the former is that it is perhaps a more accurate estimate of the level of consumption being enjoyed by a household at the exact moment it exits the labor force. The justification for using the latter is that earnings in a single year or a small number of years directly preceding retirement can be relatively volatile—especially since many households may not retire all at once and may instead opt to gradually lower their working hours in the years prior to their retirement—and consequently may not reflect the standard of living a household has actually become accustomed to during its working years as accurately as a longer-term average can. Which method produces a higher estimate of preretirement income will depend on a number of factors, including whether years of zero earnings are included and exactly how many years are used to calculate an average earnings measure. The second issue on which studies differ when estimating preretirement income is whether or not income totals should include sources of income beyond earnings—that is, wages, salary, and self-employment income—such as capital income and imputed rental income. While some studies choose to only count earned income, others choose to count additional sources of income as well, which serves to increase income totals and may consequently increase the share of households deemed to be at risk, since households would then have to save more money to hit the same income replacement rate. Those who prefer more limited measures of income may do so because they believe forms of income such as capital income are not as frequently used to fund preretirement consumption as is earned income. Those who advocate for the inclusion of income sources beyond earnings generally maintain that households do take these income streams into account and utilize them when making consumption decisions, and consequently, this income cannot be ignored when attempting to measure overall preretirement consumption. Looking at the studies described above, both the analysis by Butrica, Smith, and Iams and the CRR’s National Retirement Risk Index calculations utilize longer-term income averages. Butrica, Smith, and Iams use an average of a person’s 35 highest-earning years—excluding co-resident income and imputed rental income—as their measure of preretirement income, while the CRR defines preretirement income as the average of household lifetime earnings including capital income and imputed rental income. The NIRS study uses replacement rate targets that consider preretirement income to be only the income earned by a household directly preceding retirement, and the Survey of Consumer Finances income measure it utilizes includes both earned income and income from all other sources, including capital income. Finally, Gale, Scholz, and Seshadri do not use replacement rates in the same manner the other studies do, instead using records of lifetime earnings to help calculate optimal wealth targets for individual households. The lifetime earnings measures they use are drawn from Social Security earnings records that record only wage, salary, and self-employment income. Also of great importance is how households will spend their assets in retirement. Whether it is assumed that households will liquidate the entirety of their assets to support consumption in retirement, as well as whether households are assumed to purchase products such as annuities to manage the long-term drawdown of their savings, will have a significant impact on the share of households deemed to be at risk. Generally speaking, those analyses that assume households will liquidate a larger share of their net worth and that assume that households will purchase products that protect them against longevity risk—that is, the risk of outliving one’s savings—find a lower percentage of households to be in danger of not having enough money in retirement. The first assumption that must be made is whether households liquidate the entirety of their wealth—and their housing wealth in particular—so as to pay for consumption in retirement. If households are assumed to draw on that equity in retirement via tools such as a reverse mortgage, it will make them appear to have far more assets available than otherwise. If households are assumed not to liquidate the entirety of their assets—as seems far more likely given the fact that very few households actually make use of reverse mortgages—the assets available to them will be substantially lower, and consequently, the share of households considered at risk will rise. The second important assumption that must be made is whether households choose to purchase annuities or to self-manage their savings in retirement. If households are assumed to purchase annuities that convert their assets into a lifetime stream of income that does not run out until the purchaser dies, they will generally appear somewhat better off, as research has indicated that doing so will enable them to more efficiently maintain their standard of living in retirement than would some of the more commonly adopted self-management strategies. Again, however, making this assumption is optimistic, as the vast majority of households do not actually purchase annuities in retirement despite their usefulness for managing longevity risk. All analyses considered above assume that housing wealth will support consumption in retirement in some fashion. The studies conducted by NIRS; the CRR; and Gale, Scholz, and Seshadri all assume that home equity can be drawn on via tools such as reverse mortgages. Butrica, Smith, and Iams use a rate of return to convert home equity into imputed rental income, which they then count in their measure of postretirement income, and the CRR also counts imputed rental income in its retirement income total. On the issue of purchasing annuities, the CRR assumes that all households will annuitize all the financial and housing assets possible, while Butrica, Smith, and Iams assume individuals will annuitize the majority of nonpension, nonhousing wealth. Gale, Scholz, and Seshadri do not assume that households will annuitize their assets and instead assume that households will draw down their wealth over the course of their retirement in a theoretically optimal way in which households carefully balance the risks of burning through the entirety of their wealth before they die with the risk of needlessly limiting their consumption during retirement. While not explicitly related to households’ drawing down of their own wealth, it should also be noted that these analyses—like almost all studies of retirement preparedness—generally assume that households will receive the entirety of the Social Security benefits they are entitled to under current law. If Social Security benefits were to be reduced in the future, it would likely significantly decrease retirees’ projected income replacement rates, and far more households would be placed at risk of not having enough money in retirement. Whether studies incorporate estimates of out-of-pocket retiree health care spending can significantly impact their estimates of the share of households at risk. All else being equal, studies that anticipate higher medical spending by retirees and/or more rapid growth in this spending over time will generally find a higher share of the population to be at risk of having insufficient retirement assets than studies that anticipate less spending or cost growth, since this represents an additional cost that retired households must cover using their limited savings. Accounting accurately for these costs is extremely important because retirees’ out-of-pocket medical expenditures have grown significantly in recent decades and are anticipated to continue growing at a relatively fast pace. This is largely because while Medicare does cover 62 percent of health care costs for Medicare beneficiaries ages 65 and older, out-of-pocket spending still covers approximately 13 percent, and private insurance—now often fully paid for by retirees—accounts for roughly 15 percent. Consequently, rising health care costs are directly affecting seniors’ bottom lines, since they are still covering a significant portion of their health care costs in retirement themselves. Indeed, the Employee Benefit Research Institute estimates that as of 2014, a married couple with Medicare who have median prescription drug expenses and who purchase Medigap Plan F coverage and Medicare Part D outpatient drug benefits to supplement Medicare will still need to save approximately $241,000 to have a 90 percent chance of having enough money to just cover their medical expenses in retirement. Similarly, Fidelity Investments estimates that a 65-year-old couple retiring in 2014 will require an average of $220,000 to cover medical expenditures in retirement, excluding most dental care and over-the-counter medication costs. And both of these estimates do not even account for the projected costs of the long-term care that many households may require in the future but for which the majority of households have not purchased insurance. Given that the median retirement account balance of households ages 55 to 64 was only $14,500 in 2013, many households will have a very difficult time coming up with the funds necessary to cover these costs. The studies examined in this paper take very different approaches to accounting for out-of-pocket medical expenditures. The NIRS analysis does not appear to explicitly account for rising health care costs or the costs of long-term care. The CRR analysis treats medical expenditures as another form of consumption that is interchangeable with the consumption of other goods and services, meaning that if households encounter a significant medical event it is assumed that they can simply reduce spending on other forms of consumption to cover these costs. Their analysis also does not account for long-term care costs and does not assume that households must purchase long-term care insurance. The CRR, however, has noted that this treatment of medical costs potentially results in its understatement of the share of households at risk, since many households will require long-term care services and since many retirees will not be able to simply shift their consumption away from other goods and services and into medical services when a medical shock is experienced. The CRR found that when it did account explicitly for these costs, the at-risk proportion increased substantially, from 44 percent of all households in 2006—the last year for which the comparison was made—to 64 percent of all households. Gale, Scholz, and Seshadri’s model accounts for the potential for out-of-pocket medical expense shocks when calculating households’ optimal wealth targets. However, the size of these anticipated shocks is based on historical data from past surveys of retirees and workers that do not account for the projected growth of medical expenses and, consequently, that may serve as a poor measure of the out-of-pocket costs future retirees will face. To address this concern, the original study conducted a sensitivity analysis that allowed for the possibility of households facing additional large medical expenses and found that this significantly increased the estimate of the share of households failing to meet their wealth target in 1992, from approximately 15.6 percent of households to 20.5 percent of households. Keith Miller is a Senior Research Associate with the Economic Policy team at the Center for American Progress. David Madland is the Managing Director of the Economic Policy team at the Center. Christian E. Weller is a Senior Fellow at the Center and a professor in the Department of Public Policy and Public Affairs at the McCormack Graduate School of Policy and Global Studies at the University of Massachusetts Boston.